After taking in the views, we went on to the “Caminho dos escravos”, a 9 km long road, paved with big stones, constructed in the first half of the 19th century by slaves. This road connected the fazendas and the diamond mines. Today it is used to do ecological hikes. It is a small village, about 12 km north of Diamantina, founded in the 19th century near a cloth factory, to house the people that worked there. The factory isn’t working anymore and most of the people left. Only two families remain. 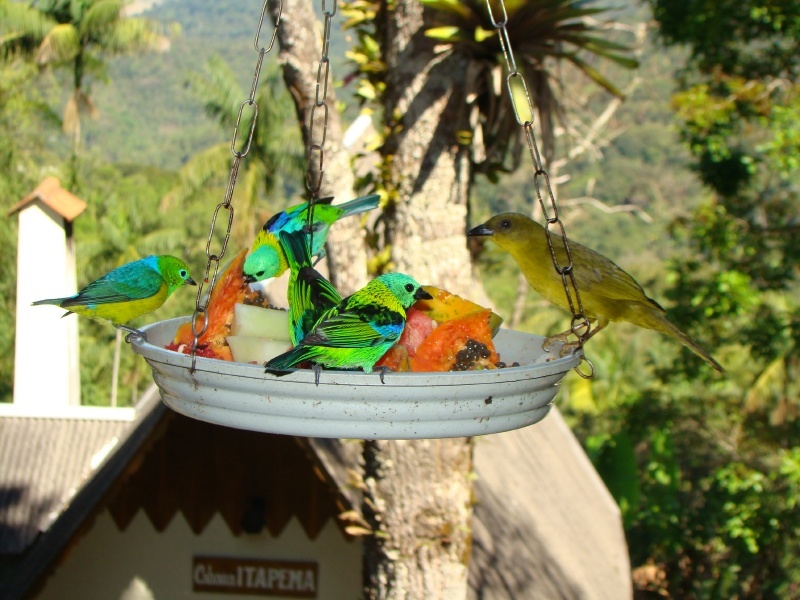 Located in a evnvironmental protection area (Parque ambiental de Biribiri), the small village is an oasis of peace and tranquility and definitely worth a visit. It was very nice meeting Antonio, a local descendant from a slave family, who was very gifted at telling the history of the place. While we were having lunch in the only restaurant, there was a guy playing violin under a tree at a small distance from us… imagine the atmosphere of the place. And finally the village of Biribiri… Oasis of peace and tranquility. After having lunch in the village, we continued our exploration, visiting one more waterfall, and went back to the pousada, where our hostess Beatrice welcomed us with a delicious table full of minas gerais delicacies… no extra charge. I must say our stay at pousada Castelinho was delightful and Beatrice and her staff did everything to make us feel at home… The pousada has a main house and 4 cabins (chalets) but I do recommend to stay at the main house, which is a little more expensive but you feel much more part of the family, which is what pousadas are all about. Day 6 is about getting to Conceição do Mato Dentro, a small city about 130km south of Diamantina. Despite its size, it has managed to earn the title of “Ecotourism capital of Minas Gerais.To get there we would have to ride the authentic Estrada Real, which in this area is mainly dirt roads and means more dust ahead.Since it was a relatively short riding day, we wanted to get to our destination around noon, to have some time left to go hiking to the highest waterfall in Minas Gerais: the “Tabuleiro” waterfall.The first leg was from Diamantina to Serro, the city where we had lunch 2 days earlier. After that we would pass Alvorado de Minas and a few other small places. Most of the roads would be dirt roads, but, like I mentioned before in this report, here and there we saw the signs that more and more roads are being asphalted. When I passed here in August 2010, this was still an authentic dirt road. As you can see, the nxt time we will pass here it will be a new, good quality asphalt road. The riding was over, but we weren’t done for the day. Our pousada was located close to the entrance of the “Parque Estadual Serra do Intendente”, where we could do a hike to the Cachoeira do Tabuleiro. It was not the easiest of hikes, with a very steep and at times slippery section to get down to the river that leads up to the waterfall. I need to come back when the fall looks like this… must be awesome to rappel off of this one. As I said… Ridiculously small amount of water… The almost 300m high wall was an impressive sight though. Alex, Maryel and myself went in for a swim (that usually was just a few seconds, due to the low temperature of the water :)). After our hike, a well deserved relaxing moment at the pousada. Today we ride to Ouro Preto, the city that was once called “Vila Rica” (Rich city) due to the fact that it was the place where all the taxes were collected. The gold and diamonds, coming from the north (Diamantina), but also from the surrounding area, had to pass through Ouro Preto in order to be melted and converted into bars that carried the seal of the Portuguese Court. A tax of 20% (um Quinta – one fifth) of all the gold that passed here was taken and went straight to the Royal family. Apart from the “Quinta” there was a fixed tax (+/- 1000 kg of gold) for the posession of a mine. Once the mines started to run dry, the owners of the mines were no longer able to pay these taxes and most of them lost their posessions. Around that time, Brazil was being kept kind of a secret to the rest of the world, but on the other hand, the sons of the richest land owners in Brazil were sent to Portugal to study, and that is where they learned about how things were changing, especially in France and the United States. Many of them returned after their studies with ideas of an independent Brazil, and that is how Minas Gerais became the center of a movement for the independency of Brazil. For the time being, there are still lots of roads with beautiful viewpoints. Here, we were getting close to Itambé do mato dentro. We finally arrived in Mariana, another historical city, about 15 km east of Ouro Preto. And then there was Ouro Preto… Enjoy the following pictures of this beautiful city… This building is the Museu da inconfidência. The “inconfidência Mineira” was the movement, led by “Tiradentes” for the independence of Brazil. One of the many beautifully decorated churches. Leaving Ouro Preto, we stopped at the local artisan market, where they sell primarily artifacts in soapstone… It opens at 7.00 am, which I thought was pretty unusual … Anyways. In Barbacena, we had to find our way through the city to get on the MG338, leading south west for about 62 km, to Santa Rita de Ibitipoca, where the asphalt runs out. The last 20 km to Conceição de Ibitipoca was unpaved, but nothing too difficult to ride. The small, winding MG-338, from Barbacena to Santa Rita de Ibitipoca. These things are very common in the rural dirt roads… they are called “Mata Burro” (Donkey Killer) and are used to keep cattle from wandering off. apparently, cows and other farm animals are afraid to cross one of these… this one was a very easy one, but sometimes the space between two beams is bigger than the width of our tires… The thing to do is to cross them diagonally… that is , if you see them in time. I don’t have to draw a picture of what would happen when your front wheel gets caught in one, right? We arrived in Conceição de Ibitipoca around noon, as expected, and were planning to have another afternoon hike in the park, but we heard from the local people that the park closes on Mondays… bummer. So, the only thing resembling a LAN house that I could find, was a prehistoric PC in the back room of a clothing store. The screen image disappeared every 30 seconds and the lady had told me that I had to give it a good whack to bring the image back… that seemed to work, but also some of the keys on the keyboard weren’t coming back up after pushing them… All in all an interesting internet experience. 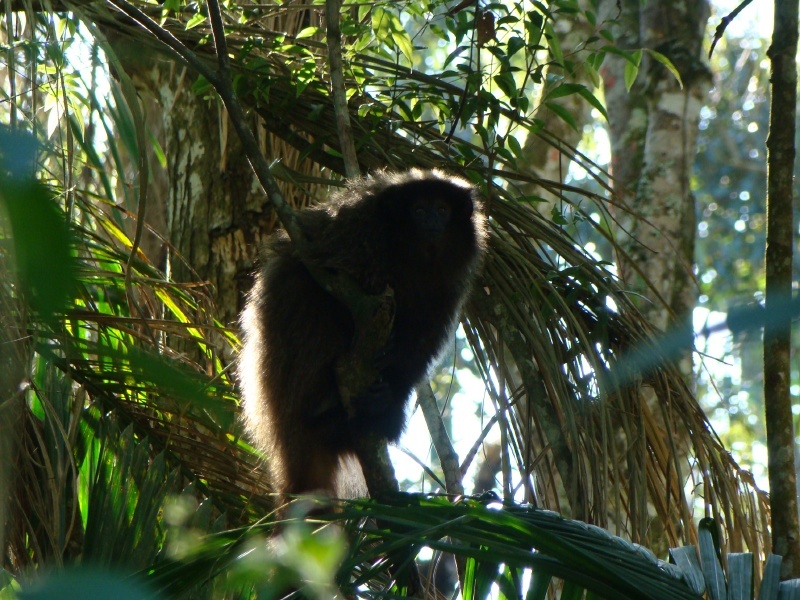 Alex and Evandro made a few new friends here … They are called “Mico Estrela” or “Black ear tufted Marmosets” and are pretty much endemic for this part of Brazil – Basically the State of Minas Gerais. It was a fantastic morning in Ibitipoca. Evandro and I were up very early to see the sun appear over the horizon. Thus ends yet another trip through one of the most important historical regions of Brazil… Thanks for sticking with me through this long post… I hope you enjoyed reading it and get inspired to come and ride in Brazil yourself. after crossing the serra do mar, we have our first view of the bay of Angra dos Reis, with over 300 islands. Riding a motorcycle through the gorgeous landscapes of Rio de Janeiro state is a great way to get a first taste of Brazil. Anyone looking for fun, sun, good rides, interesting culture, great food and a lot of mountain and coastal scenery will definitely find this an unforgettable adventure. Leaving Volta Redonda, it takes only 15 minutes to find yourself riding through twisting back roads surrounded by nature. To get to the coast we take the Serra do Piloto, crossing the Serra do Mar, a 1500km mountain range stretching from Espirito Santo all the way down to Santa Catarina in the south of Brazil. Hitting the coast in Mangaratiba, a port/ fisherman’s village from where you can take boat trips to Ilha Grande, one of the more than 300 Islands in the Bay of Angra dos Reis, we continue our journey following the BR101 to the west. This road follows the coast and is considered one of the most scenic coastal roads of Brazil. Our first stop of the day is Paraty, the colonial port town, from where in the 18th century gold and diamonds were shipped to Rio de Janeiro and from there to Portugal. Many of these gold transports were attacked by pirates, who had found a great hiding place on the aforementioned Ilha Grande. Due to it’s preserved colonial and imperial architecture, Paraty became a world heritage site in 2004. After a brief visit to Paraty, we continue on the BR101 and stop to have lunch in Trindade, a small, laid back village with paradise-like beaches about 30 minutes from Paraty. After a tasty meal we start the last stretch to Itamambuca beach near Ubatuba. The cobblestone streets of downtown Paraty, virtually unchanged since the 17th century. In 2004 this little colonial town became a world heritage site. Day 2: Serra da Mantiqueira and Circuito das Aguas. Our goal for today is the city of Caxambu, and after a delicious breakfast at pousada Todas as Luas, we take off in the direction of Ubatuba and from there, head north and into the Serra do Mar once again. The road leading up into the mountains from Ubatuba is top quality asphalt with a few very tight hairpins. From up in the serra you have a great view of the Costa Verde. Next, it’s on to Campos Do Jordão. Brazil’s highest located city (1630m) and also referred to as “Brazilian Switzerland”. The city’s architecture is mainly Swiss, German or Italian inspired. We visit the local Artisan brewery (Baden Baden) , which brews 7 different beers, based on old German recipes. We are also offered a taste sample of the different beers, but we have to pass on that, because we still have a long way to go and Brazil has a Zero Tolerance policy towards alcohol and driving. The entrance to Campos do Jordão, also known as Brazilian switzerland. Founded by Swiss settlers and with its elevation of 1640 m, the highest city in Brazil. After leaving Campos do Jordão, we headed further north, taking the first real dirt road of the trip, a +/- 30km stretch to Piranguçu. The first part of the road leads through the Environmental protection area of the Serra da Mantiqueira and offers some great views of the surrounding mountains. The rest of the way to Caxambu is all twisting back roads of good quality asphalt, but unfortunately for us, it started raining during our descent from Campos do Jordão and by the time we reached Caxambu we were drenched to the bone. The bad weather prevented us to to see a lot of the town, which is famous for its twelve mineral water sources, each with its unique medicinal qualities. We checked into a pousada in the center of Baependi, some five kilometers from Caxambu. and spent most of the evening trying to get our clothes dry for the next day. Today our trip will take us through an area known as the “região das montanhas mágicas” or the “region of the magic mountains”, to get to our destination. This area is known for its many waterfalls, native forest, hiking trails, colorful birds and other wildlife(Locals told us that there are even onças – leopards – roaming this area) which offers lots of possibilities for the practice of eco-tourism and all kinds of outdoor sports. Hiking, rafting, mountain biking, rappelling… it’s all possible here. Heading south, we pass through the small villages of Liberdade and Bocaina de Minas. From there further on to Passa Vinte and Santa Rita de Jacutinga, where we stop for lunch. By then we are already starting to look pretty muddy, but the ride so far was great.This area has very few asphalt roads, so for most of the day we take to the dirt roads. The constant drizzle makes the roads slippery, but not to the point that we cannot ride them. After lunch, we move on, and some 25 km from Santa Rita de Jacutinga, we visit Fazenda Santa Clara, a beautiful 18th century farm that made quite a name for itself by reproducing slaves instead of coffee or sugar-cane. Halfway the 18th century it became illegal to import African slaves, so farms like these kept the slave market alive. 18th century Fazenda Santa Clara – instead of coffee or livestock, this place produced slaves. Next, we pass through the Serra da Beleza, an area that attracts many UFO spottersfrom all over the world and make our way to Conservatória, a very musical place, as the name suggests, also known as “a capital mundial da seresta” or “world capital of serenades”. Every Friday evening, guitar players roam the streets, playing their serenades and filling the air with melancholic music and songs of love and broken hearts. As a result of the abolition of slavery in Brazil in 1888, coffee production collapsed and many of the former coffee farms (fazendas) became cattle farms or were converted into museums or guesthouses (pousadas).We leave the magic mountains and the Serra da Beleza behind us and continue on our way to Miguel Pereira, located in the region called “Vale do Café”. This is the valley of the Paraiba do Sul River. In the 19th century, 75% of the world’s coffee consumption was produced in this region. Leaving Miguel Pereira, and the Vale do Café, we start climbing again. Today we will cross the Serra dos Órgaos, located some 50km north of Rio de Janeiro. Petrópolis, the imperial city of Brazil: In Brazil’s Imperial period (1822 – 1889), Pedro I, Brazil’s first emperor fell in love with this area after visiting it and decided he would have a palace built to spend the hot summer months. With the help of a small army of German immigrants, he started building what is now the Imperial city of Petrópolis. His plans were continued by his son Pedro II. A number of famous people used to live in Petrópolis, one of which is inventor Alberto Santos Dumont, the “father of aviation”. His house, besides the cathedral and the beautiful Imperial Museum, is one of the touristic attractions of Petrópolis. From Teresópolis, it is about 60 km more to Nova Friburgo, another city founded by Swiss settlers and today the “capital of lingerie” of Brazil.The city was struck severely by a flash flood an mudslides in January 2011, one month after we visited it.After doing a small city tour in Petrópolis, we take the twisty road through the National park of the Serra dos Órgãos and move on to Teresópolis, the sister city of Petrópolis, named after the empress Teresa Cristina, wife of Dom Pedro II. Teresópolis is famous and loved amongst rock climbers.One of the most famous rock formations of the Serra dos Orgãos is the “Dedo de Deus” or “finger of God”, which on clear days can be seen from Rio de Janeiro. The flood was caused by one month’s worth of rain in 24 hours, and came down upon the city and surrounding area’s during the night, destroying hundreds of houses, killing over 800 people, and leaving thousands homeless. The cities of Petrópolis and Teresópolis suffered considerable damages and losses of lives too, but the area around Nova Friburgo was hit the worst. (read also: Região Serrana,- one year after the deluge). By now, the city seems to have recovered a bit, but there are still thousands of people living in tent camps, and traces of the land slides are still visible in the mountain slopes around the city, as a reminder of the biggest disaster of this kind in the history of Brazil. Our final destination, Lumiar is a district of Nova Friburgo and a place of exceptional natural beauty, especially attractive for people who love Eco-tourism. Enjoying the view in the National Park of the Serra dos Órgãos, on the way to Teresópolis. View of the city of Nova Friburgo, founded by Swiss immigrants on the run for Napoleon Bonaparte. Notice the European inspired architecture. Today we leave the mountains and head back to the coast, taking the BR142 (also referred to as “Serra-Mar” or connection between the mountains and the ocean…), which starts in Nova Friburgo and is one of the best 60 km of twisting roads I have seen so far during my trips through Brazil. The BR142 connects to the BR101 in Casimiro de Abreu, which we exit again after about 15 km to take the road to Rio das Ostras. In Rio das Ostras we start following the coastal road, heading for Búzios, probably the most famous vacation destination of the state of Rio de Janeiro. As so many (rich) foreigners decided to make Búzios their new home, this fabulous peninsula is also known as “Gringo Paradise”. Unfortunately because of the many “gringo’s”, Búzios is significantly more expensive than the average beach location and not really suited for travelers on a budget (like myself). The small village soon became the “place to be” for many European Jet Setters, and until today, Búzios still has some the flair one can also find on the French Riviera…Búzios actually used to be a pretty insignificant fisherman’s village, until world-famous French movie star Brigitte Bardot discovered the place in the sixties. The statue of Brigitte Bardot, who discovered this paradise peninsula, looking out over the bay..
We get back on the road and head for Arraial do Cabo, our place for the night. Arraial do Cabo is famous for being one of the best scuba diving spots in Brazil, or even in the world, thanks to the abundance of marine life in the relatively cold ocean water, which in turn is a result of the natural phenomenon called “resurgence“. Cold, nutrient rich water coming from the South rises to the surface and attracts a wide variety of marine life. Riding through the dunes near Arraial do Cabo… Great fun!! We keep riding as close to the ocean as possible, taking the RJ102, passing the 25 km long Araruama lagoon, eventually having to go north and connect to the BR106, which will take us to Rio de Janeiro, but not before crossing another Serra: the “Serra do Mato Grosso“, yet another region that attracts many eco-tourists and outdoor sports enthusiasts.Today, we travel through the “Região dos Lagos” heading for probably the most famous city in Brazil: Rio de Janeiro, “a Cidade Maravilhosa”: To get there from Arraial do Cabo, we first take a dirt road through the dunes, which is a totally different experience from all the other dirt roads so far. Here the terrain is sandy and soft, with few obstacles, and so pretty easy and a lot of fun to ride. To get to Rio de Janeiro from Niterói, we cross the “Ponte Rio – Niterói” a 16km long bridge over Guanabara Bay and arrive in Rio’s port area, which is currently receiving lots of attention and investments from the city, to make it more attractive for people to live, after decades of neglect.As expected, the closer we got to Rio de Janeiro, the more traffic, and the more attention to the road is needed. Before reaching Rio de Janeiro, we pass through Niterói, located on the east side of the Guanabara Bay. Niterói is the third most visited city in the state of Rio de Janeiro. It was once the State capital, but had to leave that title to Petrópolis in 1903 and later to Rio de Janeiro. Crossing the 16 km long Bridge over Guanabara Bay to get to Rio de Janeiro. Finally… The beaches of Rio de Janeiro… here’s Ipanema. Further in the background: Copacabana. Fundição Progresso: a former factory of kitchen stoves and bank vaults… currently a concert and events hall. Cathedral Metropolitana de São Sebastião – Rio’s modern cathedral. View from Rocinha: Lagoa Rodrigo de Freitas and on the mountain top just left from the middle: Christ the Redeemer. Hope you enjoyed this… we sure did. We leave Rio de Janeiro after a relaxed breakfast around 10am. The plan is, to stay as close to the coast as possible to enjoy the ocean views as long as possible… Before leaving the city we visit a last attraction: the hanggliding ramp in São Conrado. From there you have another wonderful view of the west side of Rio de Janeiro. From the hanggliding ramp, a 30 minute walk through the forest takes you to the top of Pedra Bonita, from where you have this fabulous view of the Tijuca forest, the biggest man planted urban forest in the world. Thanks for sticking with me and reading it all the way. I hope that I succeeded in giving you an idea of what Rio de Janeiro, and Brazil for that matter, have to offer someone who wants to explore the country on a motorcycle… If you are interested in doing this tour with us, check out the details and book your own motorcycle adventure on our website. In June 2011, we went on a weekend motorcycle trip through the Serra da Mantiqueira, with its endless dirt roads, gorgeous landscapes, waterfalls, rivers and small rural villages.On the second day we crossed the “Vale Histórico do São Paulo“, also known as the “Estrada dos Tropeiros” one of the historically most important regions of Brazil during the Coffee era. It was along this route that the first emperor of Brazil (Dom Pedro I) traveled from Rio de Janeiro to São Paulo to declare the independence of Brazil in 1822. Main square in Santa Rita de Jacutinga with the Igreja Matriz. Our next goal was Passa Vinte, another little village situated at the confluence between the states of Minas Gerais and Rio, where the Mantiqueira mountains form a valley that looks like the concave shell of a large oyster. the initial inhabitants of Passa Vinte gave the place the name “Cedro” (cedar) due to the large amount of these trees in the region.We rode north out of Volta Redonda and shortly after leaving the city, we were on the RJ153 that winds through a hilly landscape towards Nossa Senhora do Amparo, one of the first small villages we would pass along the way. From Amparo, we continued north on the RJ153 and crossed the state border with Minas Gerais, to arrive in Santa Rita de Jacutinga, where we stopped briefly to admire the Igreja Matriz. We quickly passed Passa Vinte to push on to Fumaça, home to the famous “Cachoeira da Fumaça” a cascading waterfall of approximately 1,5 km long, that we couldn’t pass by without stopping to take a few pictures. On route to Fumaça, we had to cross this shallow stream. Maryel is following in the Land Rover with the luggage and in case any of the bikes would have a problem. Osman had clearly done this before. At the cachoeira da Fumaça, we rested for a while, shot a few pictures and removed a few layers of clothing because by then the sun was starting to heat up things. From there, the road became more rugged as we commenced a long climb, following the Rio Preto, which forms the border between Rio de Janeiro and Minas Gerais states, to arrive in Bocaina de Minas around 14.00h. We decided to have lunch in a typical “mineiro” restaurant, where you take your plate into the kitchen, where all the food is on the stove and load up all you can eat for about 10 R$ (5 USD) per person – inclusive drinks. The Fumaça waterfall. One of the longest cascading waterfalls in Brazil. A simple but tasty lunch at the restaurant of João Grandão. Typical Mineiro food and all you can eat for about 10 R$ per person. After lunch, we had another 60 km of Dirt roads ahead, with a few more technical stretches, but our group seemed to have the necessary experience to pull it off. We spent the night at Pousada Riberão do Ouro, a rural pousada located about 5 km south of Itamonte. For 100R$ per person Single room) or 136R$ (double room) for a shared room we enjoyed great hospitality in a pleasant setting. The pousada has a swimming pool, a children’s playground, a fishing pond and a restaurant serving typical cuisine of Minas Gerais.We reached Itamonte, our place for the night around 17.00h, just before it would start to get dark. Probably the only thing I miss about Europe, are the long days in the summer. Here in South east Brazil, in the wintertime it is dark by 18.00h, but in summertime it also gets dark pretty early, around 20.00h. The next morning, after a delightful breakfast, we started the second day of our trip. After the many kilometers of dirt roads of the day before, today would be a day with more asphalt roads, starting with the 50 km descent out of the Mantiqueira mountains, from Itamonte to Engenheiro Passos,where we would take the Dutra highway for about 10 km, take the exit in Queluzand from there push on to Silveiras, the first of the historical cities of the Vale Histórico. Our place for the night: Pousada Riberão do Ouro just outside Itamonte. an oasis of peace and tranquility in an open green setting. The descent from Itamonte to the Dutra highway is almost 50 km of twisties, winding through the fabulous Mantiqueira landscape, littered with spectacular views of the Itatiaia park region. The quality of the asphalt starts out to be excellent when leaving Itamonte, which is tempting to open the gas a little more, but once across the São Paulo border, the road quality decreases significantly and we had to keep the speed down to avoid accidents. We made it to the Dutra highway, then to Queluz and started our next leg to Silveiras which would take us through a stretch of dirt road that I had never taken before, but since it was indicated on my GPS, I figured it would be ok. Turned out that this road, after a few kilometers, became a private road and so we started following another road that seemed to go in the direction of Silveiras, but was not on my GPS. At one point we came at a T-section and took a right turn. After a few kilometers, we encountered a local man and I asked for directions. Apparently, this road would eventually become too bad for the bikes and even for the Land Rover, and according to him, we should have gone to the left at the T-section. We backtracked the short distance and eventually got on the right road, which connected to the Estrada dos Tropeiros, and we arrived in Silveiras. Silveiras is the place where the headquarters of the National Foundation of Tropeiros was established. The tropeiros were the people who traveled long distances with a pack of mules to transport goods from one big city to another. Usually from Rio to São Paulo or vice versa. Tropeiros also used to transport gold and diamonds from the interior of Minas Gerais to the coast. Silveiras: First city of the Estrada dos Tropeiros and Headquarters of the National Foundation of Tropeiros. The fountain (Chafariz) at the central square was the place where all the citizens came to get their water. In Silveiras, a local guy who introduced himself as Toninho came up to us and started telling us about the horseback tours that he organises. They go with a group of people on horseback, traveling through the region the way the ancient Tropeiros used to do. Seems to me like a great way to spend a few days. We had a drink in Areias and decided that we would not stay on the Estrada dos Tropeiros, but take another route that would lead us back north to the Serra da Mantiqueira and the dirt roads. I found a dirt road leading to Resende, from where we could get to Penedo and from there further on in the direction of Visconde de Maua.After taking in the atmosphere in Silveiras, we moved on to Areias. The cities here are all located around 25 km from each other. This is the distance a tropa could generally travel in one day. Areias was once one of the richest cities of São Paulo state, thanks to the coffee industry that was flourishing here. It was also the preferred weekend getaway for the coffee barons of the region. We pushed on to São José do Barreiro, which is the place from where you can get access to the Bocaina National Park, and found the entrance to the dirt road to Resende about 14 km further. It was the first time I took this road and was pleasantly surprised with its condition. We took Gas in Penedo and started the climb towards Visconde de Maua. Halfway to Visconde de Maua, we turned right to get to Pedra Selada, from where we went on to Fumaça. The last leg of the trip took us to Falcão, Quatis, Amparo and finally Volta Redonda. More dirt roads to Pedra Selada. After almost 500 km of motorcycling, we needed a suitable closing of the weekend, so after everybody had the chance to clean up and have a snack, we gathered at the International Karting track of Volta Redonda. where we gave in to our need for speed for one last time. Osman gave everything he had and turned out to be the fastest one of us. Osman finished first, but we are all winners here… FLTR: Robert, me, Osman, Maryel and George. Osman, George and Robert, thank you for a fantastic weekend. You guys are welcome to come back any time. The region, with its mountains, countless streams and waterfalls offers many possibilities for outdoor activities like mountain climbing and hiking, rappelling, rafting and mountain biking. It is commonly known as “Mauá”, and is one of the most popular mountain destinations in southeastern Brazil. The area around Visconde de Mauá is also famous for its collection of high quality Pousadas and chalets. I took this trip together with my wife Fernanda, and for her it was actually the first time she went on a hike like this. Fernanda at the beginning of the trail up Pedra Selada. One of the resting points along the way. Nice to take a breather and take in the view. Local fauna… a millipede. We saw quite a few of those. One of the cachoeiras along the trail… The water is drinkable. The sign says “2500 m”, but this is the distance, not the altitude. the other peak of the mountain is popular amongst rock climbers… see them there? Hope you enjoyed this post… If you ever find yourself in Rio de Janeiro and feel like doing this or one of the other fantastic hikes in and around Rio, let me know. So far, I was able to explore most of the Serra by motorcycle, sometimes getting stuck and having to backtrack due to bad road conditions. My biggest “frustration” (if you can call it that) so far was always that I hadn’t been able to find a decent dirt road to get from the east side of the serra to a city called “Itamonte”, located on the west side of the serra without eventually ending up having to take the BR116 (highway between Rio de Janeiro and São Paulo) for about 20km and then take another asphalt road leading up to Itamonte… Although the twisting climbing asphalt road to Itamonte is incredibly scenic as well, the presence of cars, trucks and buses makes it a lot less attractive for an adventure motorcycle rider.What can I say, I just loooove the dirt roads. Anyways, when a group of guys from Rio de Janeiro asked me to organize a weekend tour, I got more determined than ever to find a dirt road route to Itamonte. The best option I could find on the GPS map was a road that starts in Bocaina de Minas, and that leads all the way to Itamonte. This road cannot be found on Google maps, so that would be an indication that it is a road “off the beaten track”. Here’s the GPS map showing the 60km dirt road connection between Bocaina de Minas and Itamonte. I talked about it with my colleague Maryel, who is my support car driver, but also a local motocross champion, and we decided we would go and explore the route. 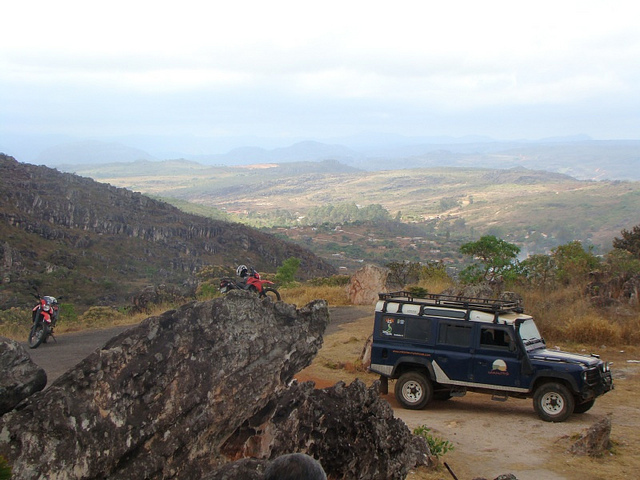 Starting in Volta Redonda, we took the RJ-153 to Amparo. From there we made our way west – north – west – north, passing the little villages of Quatis and Falcão, arriving at the “cachoeira da Fumaça“, one of the most spectacular waterfalls of the region. After a short visit of the waterfall, we started a pretty steep climb to the point where we had to take a right again to get to Bocaina de minas. In the mean time we had passed the state border between Rio de Janeiro and Minas Gerais. Bocaina de Minas is at an altitude of a little over 1200m, so we kept climbing a little more. When we got to Bocaina de Minas, it was time for lunch, so we went out to look for a place that Maryel remembered from an earlier visit here. The restaurant was called João Grandão (big John) referring to the size of the owner. It was a very simple restaurant with good, honest food. We paid 16R$ for the two of us (all you can eat) so it was also really cheap. Before tackling the 60km of unknown road ahead of us, we asked around to see if anyone could tell us if we would be able to get to Itamonte taking the dirt road, and the locals weren’t very positive. They told us that many of the roads between there and Itamonte had been destroyed by the heavy rains of the summer, and they were doubtful if we would make it through. Despite the negative answers of the locals, we decided to go on and see how far we would get. The worst that could happen was that we would have to backtrack and try another route another day. As with almost all major dirt roads in the interior of Brazil (and I assume also in other countries), they seem to follow a river, whis is logical, since the first explorers of the land (called the Bandeirantes) also followed the rivers, or the trails already in use by the indigenous people. This road was tracing the Rio Grande and the first 15km to Santo Antonio do Rio Grande was pretty easy. A broad unpaved road with no difficulties. Once passed the little village of Santo Antonio, we started to see what the locals in Bocaina de Minas meant… almost every few 100m the road showed signs of repairs, some of which were ongoing as we passed several groups of workers, doing their best to make the road useable again. All in all, the last 35km to Itamonte were a great ride with a few more technical stretches but nothing really difficult. Getting closer to Itamonte, the road gradually becomes more difficult, and we also saw some areas where the rains had done some significant damage, but also these stretches were repaired or in the process of being repaired.